Centrum Women Multivitamin Tablets have been specifically developed to support women’s health and wellbeing, delivering adjusted levels of vitamins and minerals for optimum efficacy and benefits. 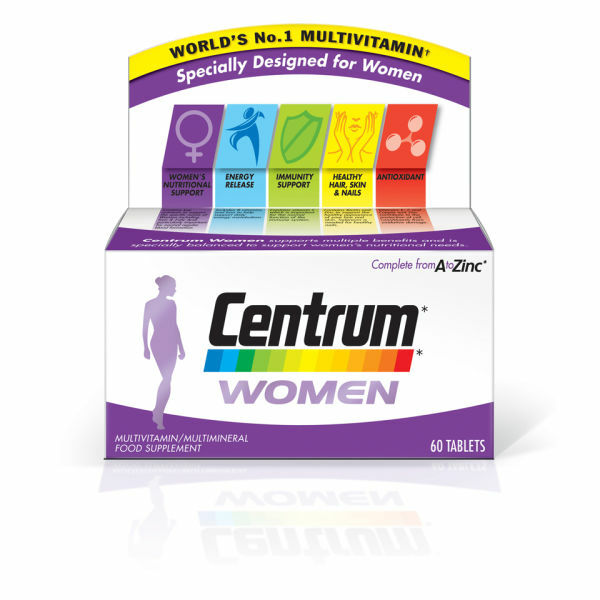 The world’s number one multivitamin is established through 30 years of scientific research and nutritional expertise, contributing to healthy skin, hair and nails as well as supporting sustained energy release and a normal immune system. 24 key vitamins and minerals work in tandem to boost vital resources, including Iron and Folic Acid, which sustain regular blood formation, while Biotin, Zinc and Selenium help revitalise hair and nails. Vitamins E, C and Copper seek to protect cell constituents from oxidative damage to delay deterioration. The daily food supplement is an easy, ideal solution for ongoing health maintenance.